Explanation of Saturday Class by the teachers ! 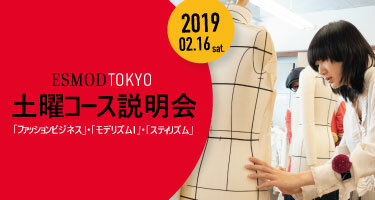 Saturday class Stylisme (Design), Modelisme (Pattern making & Sewing) and Fashion Business teachers will explain you directly the content of the lessons. Portofolio and clothes made by students this year will be explained and we will answer to your questions during this session. In addition to talks about the fashion industry, it is a great opportunity to understand in depth the ESMOD lessons.